Seventy years ago this month, Anne Frank died in the concentration camps of Bergen-Belsen, leaving behind, stashed in the rooms where she and her family hid from the Nazis in Amsterdam, one of the most valuable historic documents of our time: her diary. But try telling this story in a Dutch classroom today. "Holocaust Classes? Bulls**t! Say the Students" declared a headline of Dutch newspaper AD. Indeed, large numbers of Dutch students, all of them Muslim, refuse to listen to lessons about the Shoah [the Holocaust], denouncing them as exaggerations and lies, and threatening their teachers. 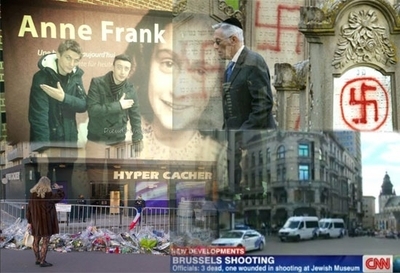 It is a capital example of the kind of exploitation one finds increasingly among radicalized and even non-radicalized Muslim youth in Europe: for even as many question the existence of the concentration camps, the efforts at genocide, they demonstrate in pro-ISIS and anti-Israel rallies chanting "All Jews to the gas" and "Hitler was right." And as the world witnessed with the killings of Jews in Brussels, Paris, and Copenhagen in the past year, this kind of Jew hate extends far beyond the borders of the Netherlands, where Anne Frank's German family first sought refuge. Now, as then, there is no real refuge in Europe for the Jews. If this sounds like hyperbole, look at the recent record: the killing of four Jews at the Jewish Museum in Brussels in May 2014 by French radical Muslim Mehdi Nemmouche; the slaughter of four Jews at the kosher Hypermarche in Paris by would-be jihadist Amedy Coulibaly, on Jan. 9; and the murder a month later of a Jewish volunteer guard at a Copenhagen synagogue by Arab-Danish extremist Omar Abdel Hamid El-Hussein. But that's not where the violence stops. There have been dozens of smaller incidents: firebombings of synagogues in Paris and Wupperthal last summer; the beating of a Swedish Jewish woman by Muslim gangs in Malmo that same summer (her crime: wearing a Star of David necklace); and the voice on a Belgian commuter train in February 2014 that calmly announced, "Ladies and gentlemen, we are approaching Auschwitz; all Jews are requested to disembark and take a quick shower." And there are more: an attack on a Jewish woman last August in Amsterdam; a French teenager beaten up outside of his school by "African" youth in October; the employee of the Netherlands' Ministry of Justice, who tweeted in August that "ISIS is a Zionist plot." In January, former Scottish civil servant Zaim Mohammed posted to his Facebook page in January, "My grievance is with Hitler for failing to exterminate entire Jewish race." Notably, the UK saw its highest level of anti-Semitism on record in 2014, including more than 80 physical assaults. Unsurprisingly then, Europe's Jews are on high alert and afraid. Marco Mosseri, an Italian Jew now living in Brussels, spoke for many when he told the New York Times last September, "This summer, I started to see the world in a different way. I was scared. I spent several nights without sleep. For the first time, I was thinking that maybe I could die from my religion." Several attacks later, you have to wonder how he feels now. Dozens of reports on the rise of anti-Semitism in Europe have protested that "this is not 1933," noting that the attacks on Jews these days are made by civilians and not the State: Jews are hardly being rounded up, or officially banned from public life. But increasingly, participation in public life is becoming, for many European Jews, a risk they calculate each time they step beyond the threshold of their front door. Congregants are reminded to remove their yarmulkes before leaving temple. Schoolchildren hide their Stars of David beneath their shirts. The sense of randomness and unpredictability of violence engenders a different kind of fear. Moreover, as the Times article observes, Jews frequently find that while their governments may not engage in outright anti-Semitism, they do less than they could to stop it. It was only after the bloodbath at the Jewish Museum in Brussels that the Dutch government, for the first time, agreed to cover the costs of guarding Jewish schools and institutions – an expense that, until then, had been the burden of the Jews themselves. Yet fighting anti-Semitism, the Times article points out, "is no longer seen as a priority, with Jews often perceived as privileged compared with Muslims and other minorities confronted with discrimination." Although the number of anti-Jewish crimes surpasses anti-Muslim crimes in frequency and severity doesn't seem to alter that misperception of privilege. Likewise, the fact that the vast majority of violent attacks on Jews are perpetrated by Muslims has no impact on this view. According to a report from Institute for the Study of Global Anti-Semitism and Policy (ISGAP), "anti-Semitic attitudes are significantly more widespread among Muslims than among other segments of European societies." Other surveys, notes ISGAP, "confirm that anti­Jewish attitudes are stronger among [European] Muslims than among the general population." Yet not a single Jew has been accused of engaging in anti-Muslim activity, let alone anti-Muslim violence. But anti-Jewish sentiment extends beyond the Muslim community. It has become somewhat mainstream, from the popularity of French performer Dieudonne M'bala M'bala, whose signature "quenelle" – an upside-down Nazi salute – is replicated by fans (mostly, but not exclusively Muslim youth) across Europe, to the efforts in the Netherlands and elsewhere to broaden Holocaust Remembrance day to include the victims of all wars – thereby minimizing, in one gesture, the significance, the historical uniqueness, and the memory of Europe's own near-destruction of the Jews. Perhaps this development explains why so many teachers have given up teaching about the Holocaust in many European schools and why the governments do little to discipline those students who refuse to listen, and even those who issue threats. It certainly explains the fact that not all of the rise in anti-Semitism can be attributed to Muslims: Pro-Palestinian far left groups and neo-Nazi far right organizations can take credit for their own fair share. According to IGSAP, in France, "twenty-four percent of the Muslim sample and 12 percent of the general population disagreed that the Holocaust should be taught to younger generations to avoid its repetition." Moreover, 57 percent of Muslim interviewees, 25 percent of the general population, 32 percent of Front National sympathizers and 28 percent of Front de Gauche sympathizers agreed that 'Zionism is an international organization that aims to influence the world and society for the benefit of the Jews." No wonder, then, that Danny Pinto, a Dutch Jew who grew up in Amsterdam, told Dutch daily de Volkskrant, "I'm more conscious now of the dangers; I always look for the emergency exits." Before her death from typhus only weeks before the liberation of the camps, Anne Frank confided in her diary: "I keep my ideals, because in spite of everything I still believe that people are really good at heart. Seventy years later, her ideals still remain a dream, locked inside the pages that she wrote. It would be natural for an adolescent girl trying to make sense of the world amidst genocide that she would close her diary with the belief that people are (still) really good at heart. As adults, we should be in acceptance that the statement is completely false. People who are really good at heart don't set out to murder other people. Such people are mentally, emotionally and characterologically defective -- many are psychopaths and sociopaths but not always. Some people are also simply evil. The violence itself is also evil, but there are some evil people with varying levels who do not always resort to violence. But how can we conclude that the ones to do become murderers and perpetrators are "still good at heart.?" But liberals always believe differently; they think like Anne Frank did. While it may be acceptable as an adolescent, it is NOT acceptable in adulthood and the reality right now is that we are facing an existential threat. And again, people remain in denial and want to hold onto the "good at heart" theory. 1) Hamas is not composed of people who are "still good at heart." 2) ISIS's recruits are not "still good at heart." 3) A mother who hates Jews enough to strap her kid into a suicide bomber vest is not "still good heart." 4) The Iranian Mullahs who make statements about wiping Israel off the map are not "still good at heart." 5) The attacks across Europe against Jews were committed by people who are not "still good at heart." And based on his actions over his two terms, Barack-Hussein Obama is a man who is not "still good at heart." what Jews need most is to devote themselves to combat training so that they can deal on the spot with an attacker or attackers. They should study a system like karate or Jiu jitsu.